Indie Freebies is back from its Christmas break, feeling slightly drained and rather portly from gluttonous overindulgence and copious intoxication. Nonetheless, it’s ready to delve back into the weird and wonderful world of free games. 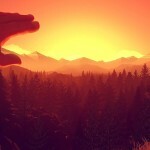 This week’s highlighted titles are: Russian Roulette Tournament, a simulator for Christopher Walken wannabes; Behind the Wallpaper, a sombre visual novel inspired by the tragic story of Anne Frank; and Loft Is in the Air, a wacky platformer based around creating one-room loft apartments. If you’ve ever watched that iconic scene from The Deer Hunter, the one where Christopher Walken sticks a loaded pistol to his temple in a seedy back-alley gambling den somewhere in Saigon, and thought “That looks fun!”, well then you’re probably a suicidal nutjob. Not to worry though, because Russian Roulette Tournament brings all the thrills and excitement of shooting yourself in the face for money to the comfort and safety of your own home. But I know what you’re thinking: isn’t Russian roulette just down to dumb luck? Well, perhaps it is in real life, though I wouldn’t actually know because I’ve never played it. However, Russian Roulette Tournament is surprisingly involved, requiring a satisfying combination of skill and strategy, naturally in addition to some good fortune, in order to master its poker-style gameplay. The aim is to survive nine duels in order to reach the final to have a shot (pun intended) at winning the tournament. However, you don’t need to win every match, you just need to survive and accrue enough money to advance to the next leg. There are three ways to win a match: your opponent kills themself, they fold twice in a row, or they breakdown from too much stress. 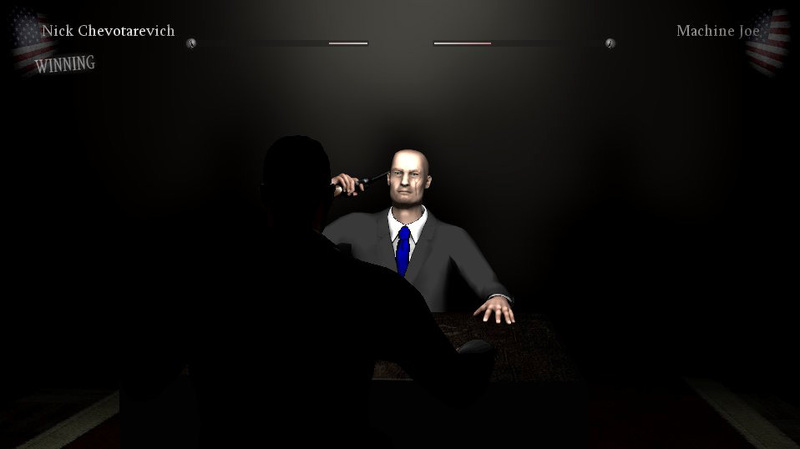 Matches are divided into rounds, with you and your opponent taking it in turns to load the gun and shoot first. On each turn you can choose to pull the trigger or fold. If the timer expires during your go, you’re folded automatically. 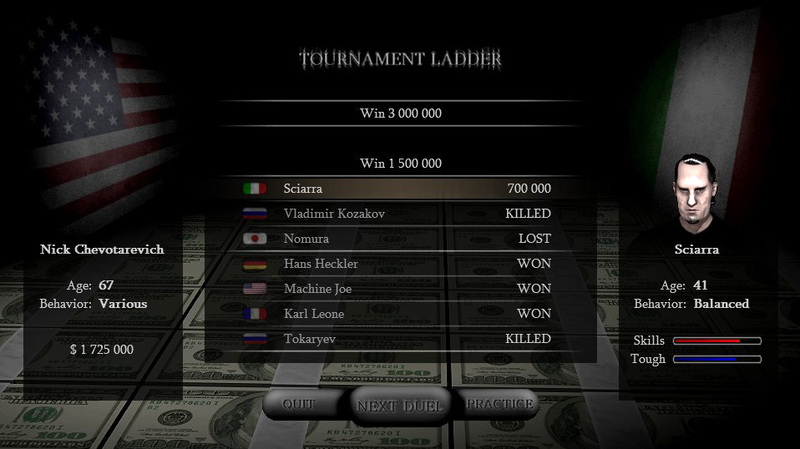 Winner takes all, with extra cash being awarded for kills and drama, such as longer matches and more daring gameplay. 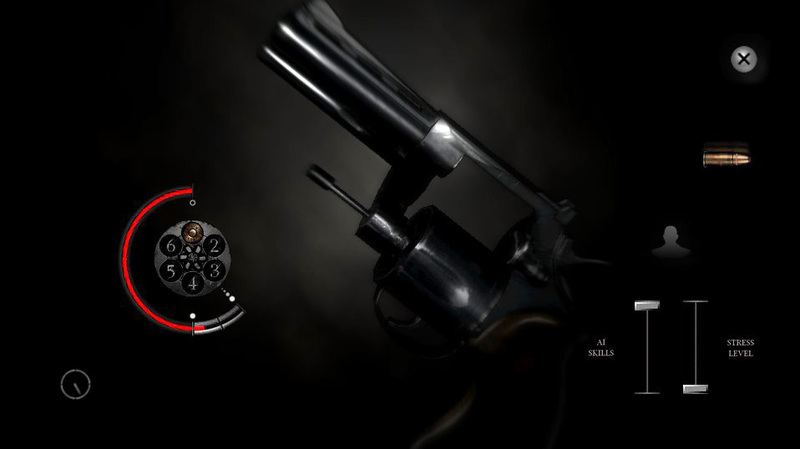 The skill part lies in the loading of the gun and guessing the position of the bullet following the spin. You choose one of the six chambers to insert the bullet and then charge up the power gauge to spin the cylinder. Minimum power is the hardest to pull off but always results in exactly three revolutions and the bullet resting in its starting position; whereas maximum power is entirely random, meaning it’s impossible to anticipate where the slug will end up. In contrast, the middle range generates a semi-predictable outcome that’s affected by gravity. If you load a lower chamber, the bullet will probably stop somewhere at the bottom. Ultimately, the faster the spin, the more random the result, but also the more stress you place on your opponent. Even more tricky is predicting where the bullet is when your opponent spins, but it is possible. You’re shown which chamber is loaded, and by carefully observing the speed and behaviour of the cylinder, you can make an educated guess. For instance, if the cylinder stops abruptly, then the slug was travelling upwards and is likely to be to the right of the barrel (the cylinder is always spun and advances anti-clockwise). The strategy element comes from the AI behaviour and attempting to manipulate it to your advantage. There are 11 opponents, each having their own personality. Some are more cautious, others like to live life on the edge, literally. Skill level determines their precision in chambering and prediction, toughness their willingness to take risks and ability to withstand pressure. Tougher players are easier to kill but less prone to folding. The other key factor is stress, which varies according to the tactics (spin strategy) and events during the match. Higher levels make it harder for both you and your adversary to spin accurately but also increase their likeliness to fold. And as mentioned earlier, too much stress results in automatic resignation. Sounds complicated, I know. Fortunately, there’s a set of detailed and well-written instructions that can be accessed from the main menu, including hints and basic strategy guides. Plus, there’s also a handy practice mode that allows you to get to grips with the chambering mechanics under different stress levels, and you can also test how different AI trait permutations behave and perform. And for achievement junkies, there’s a list of challenges to beat, some unlockables, and player career stats. I have to say, I’ve become a bit of an addict – if only it had a two-player mode. It’s fun, tense and challenging, and full of great drama. Plus, you’ve just got to love the restrained, snooker-style applause from the unseen audience. It all seems so civilised. Though disappointingly, you have to perform your own chicken bawking when your cowardly opponent folds. 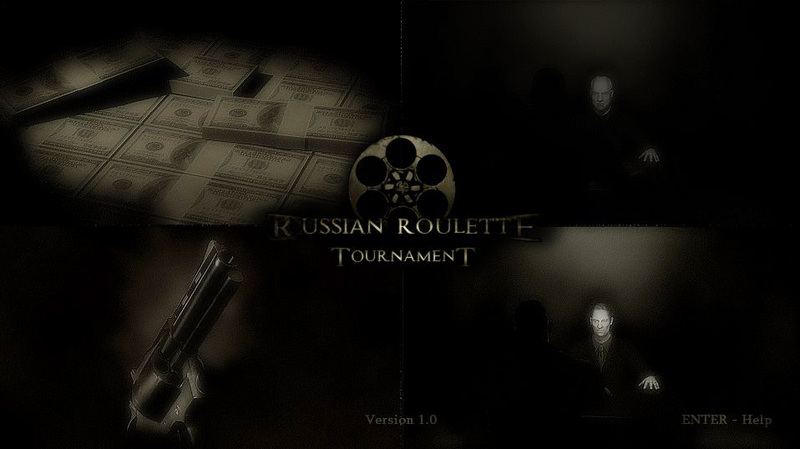 Russian Roulette Tournament is available for Windows and can be downloaded from Game Jolt for free here. The Holocaust is a delicate subject and not something to be portrayed lightly, but Behind the Wallpaper is done incredibly tastefully. 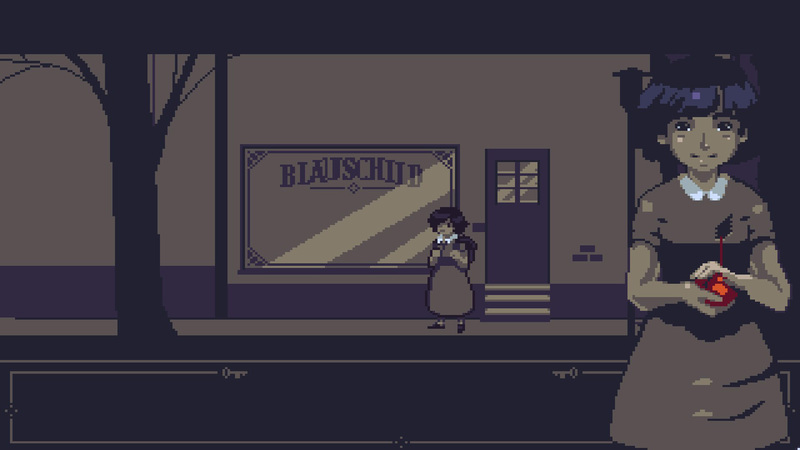 A short point-and-click visual novel, clearly inspired by the story of Anne Frank, it’s set in Nazi-era Germany and follows the struggle of Fritzi Blauschild and her family. At first, life is relatively normal for this ordinary schoolgirl, but things change quickly. Soon the family are forced into hiding. A non-Jewish friend kindly agrees to run the business while they reside in a secret room at the back of the building, all four of them cramped into a single, confined space, waiting and hoping for the war to end and the troubles to blow over. The gameplay revolves around talking with the characters, performing simple tasks for your parents, and attempting to comfort your younger brother who has no understanding of what’s happening. The piano music is tense and sombre, the sepia-tinted pixel art elegant and decorous. The story is narrated by Fritzi, holding out her bleeding heart in front of her chest. Over the course of the tale, her expression becomes increasingly forlorn. It’s tragic and heartbreaking. Depressingly, Fritzi’s commentary seems almost as relevant today: “When times got tougher, people started looking for answers. Someone they could blame. For – as it seemed – all the problems in the world. Don’t they always…?”. Behind the Wallpaper is available for Windows and can be downloaded from itch.io for free here. The one-room loft is apparently the new craze, turning savvy real estate agents into overnight billionaires. But what, there’s no open-plan apartments left to rent? That’s not going to stop someone with your initiative! 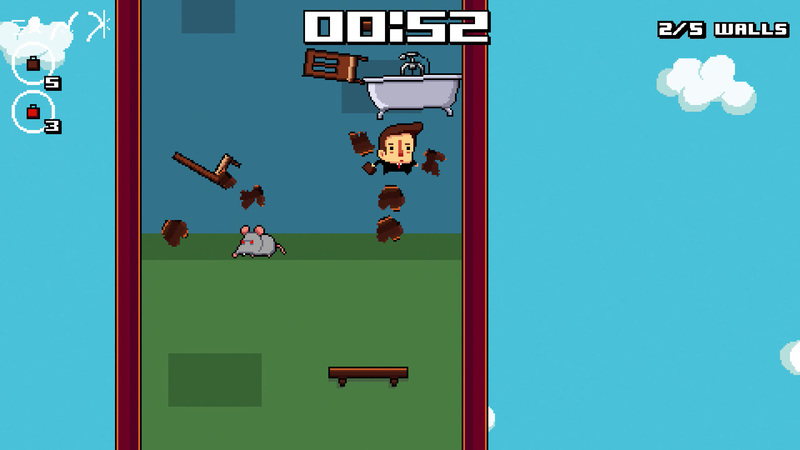 Loft Is in the Air is a fast-paced 2D platformer. The aim is to smash down all the apartment walls of each building within the one-minute time limit while simultaneously avoiding electrical hazards, vicious rats and trigger-happy security systems. Walls are broken down by charging at them. Some can only be destroyed on one side and at specific locations (the orange zigzags), others require explosives. With lots of precision jumping and fast reactions required, a controller is definitely recommended. There are six levels in total, rated from easy to hard, and these can be played and replayed in any order. Money is earned by satisfying your clients and doing the make-over in style (i.e. performing combos), and it can be spent on unlocking new abilities such as improved jumping, ninja briefcases and suitcase bombs. Be warned, later levels are impossible without these upgrades, so you do need to grind out the first level a few times to build up some cash. It’s wacky, fun, hard and joyously retro – from the cutesy 8-bit style pixel art and bleepy sound effects, to the groovy chiptune music and platforming mechanics. The best part is the varying and humorous reactions of your clients, several of whom seem rather keen on hot Venezuelan male maids. Loft Is in the Air is available for Windows and Mac and can be downloaded from Game Jolt for free here.